There are many web hosts out there and as you probably noticed in my Guide to Start a Blog, I recommend Siteground. 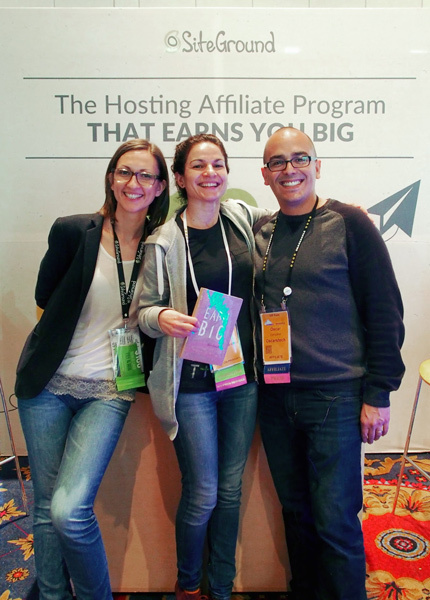 That’s me hanging out with the wonderful ladies from Siteground. But you’re probably wondering, Why Should I use Siteground? First, because I am recommending them. I have been doing this for over a decade and there are only a few hosts that I would recommend. I also know them personally. I’ve met over a dozen of their team members and have a great relationship with them. They always make sure they take special care of people I refer to them. Now, maybe that makes you all warm and fuzzy inside but at the end of the day, you should also be concerned with the technical capabilities of the hosting service. Siteground excels at this also. Let me go over some of the reasons. 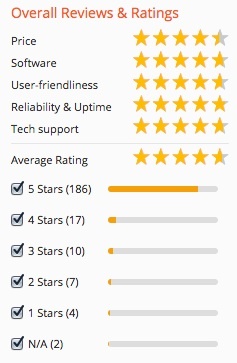 Reviews for Siteground web hosting are outstanding. Customer support. Their customer support is highly trained to handle pretty much any type of question or issue you may encounter. They take great care of their servers and network so that problems are prevented in the first place, but if something does go wrong, all you have to do is get in touch with them and they will resolve your issue quickly. Passionate team. Everyone I have talked to and met at Siteground lives and breathes web hosting. From their VP team, to their customer services representatives. These are the kind of people you want to work on your hosting services. They truly love working there. In case you didn’t know, I come from a technical background, so before I even partnered up with Siteground I asked them all kinds of questions about their infrastructure. Whether they are secure or not. I asked them what kind of software they use in the back end. I asked them about their technology and every question I asked was answered to my satisfaction. They have the technical know-how to make things work flawlessly. WordPress experts on staff. Not only do they do great web hosting and support pretty much any type of website you want to do, but for this specific case (a WordPress blog), they are ideal because they have WordPress experts on staff to help with web hosting and development. Some of their staff actually contributes back to the WordPress project and that’s important to me. Yes, they’re in business to make money but they also contribute to the Open Source WordPress.org project to make it better. They will even install WordPress for you if the easy installation system or my guide aren’t what you’re looking for. Just ask them to install WordPress for you and they’ll take care of it for you. Amazing caching technology. WordPress is a database driven system, that means that it has a dynamic component that could make your blog a little slow if you end up getting a lot of visitors or if you add a lot of plugins. While there are ways to optimize all that and make it better as you learn more WordPress, Siteground has added a layer of caching to your hosting account. This means that your blog gets delivered to your visitors faster than you can say Siteground rocks my socks! Hack proof. One of the downsides to using WordPress is that because it is so popular, it is also a pretty big target for hackers to attack. But again Siteground has your back, they have a system that actively monitors your site for hack attempts and stops them before anything happens. SiteGround is a great hosting solution for all your WordPress projects – both new and established ones. The service they provide is stable, secure and super fast thanks to the special tools they’ve developed in-house for WordPress users. That’s why I can easily recommend them as a great WordPress hosting provider! Who should I use to host my WordPress website? This is still one of the greatest online questions and debates. I actually love when this question comes up because it gives me an easy in to talk about SiteGround and their SUPERIOR hosting services. When I think of a great host I think of two words, Support and Stability. Knowing that your host will be there when you need them is huge for anyone from the beginner to the advanced developer. It is also critical that your host takes a proactive approach to keeping things running smoothly. Support and stability are two things that SiteGround does better than any other host I have worked with. Since I began using SiteGround for a new project a few months back, I’ve been blown away by their technical chops and their stellar customer service. I’ve yet to have an issue that wasn’t self inflicted, and I’ve since moved over a few larger client sites that needed a better level of service. There have been no complaints and numerous commendations. Simply put, SiteGround is doing it right when so many are dropping the ball. There are so many amazing aspects to SiteGround from their fabulous attentive staff and support, state of the are security, finely tuned performance server with locations all around the world and of course a price that can’t be ‘Beat’! This is a hosting company that really does tick all the boxes and the ticks keep on getting bigger! Thank you SiteGround. SiteGround has been top-notch from my introduction to them. Their GoGeek plan is excellent if you want the tools of self-managed hosting, without that whole “self-managing” part. I’ve placed a dozen of my own sites on SiteGround, and have been recommending clients to them, as the service is just that good.